I really like the idea of having a functional ram air hood. Suncoast Creations say there is an optional ram air itake box for an additional $90 bucks. There is also an optional heat extractors. All together the hood costs $839.95. Kind of pricey, but I really like it. Does anyone know how the air gets directed from the hood scoop to the intake? Yeah, Awesome hood, I was thinking of getting a carbon fiber hood, along with CAI, but with this hood I can kill two birds with one stone. Although at $840 it's a little steap to just jump in and get it, without knowing more. I think that the hood addresses two key things, drawing cold air into the intake and venting hot air out of the engine bay. The picture above is a guy (Don F.) from my Tampa Bay club. Don't know all the particulars of the hood but the PT is putting out some awesum power. It's loaded with all the go-fast goodies that are talked about on the forums. I would get one in a heartbeat but imo that is a bit too much. Time permitting I have another hood that I will be working on at the shop and see what I can do with it. Fodder, that would be cool if you could think of a way to use a stock hood and modify it into a air ram. 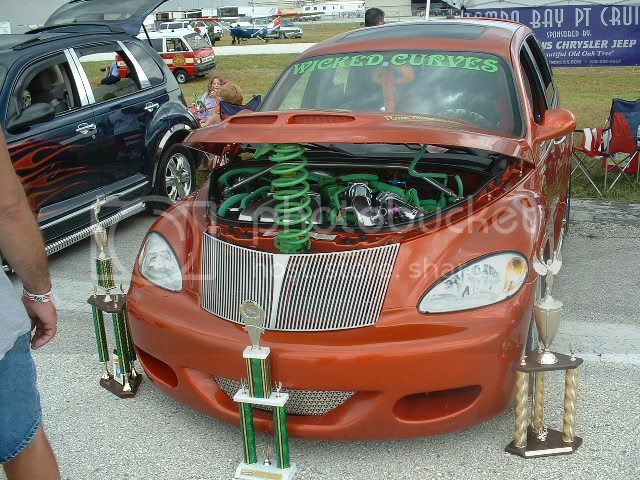 Couldn't you get a hood scoop and place it off center over where the intake is and cut a hole to get cold ram air? You'd have to figure a way to channel it over to the intake. Could be done if you are good with fiberglass or aluminum. Hey GoodHood makes a ram-air intake box converter too. It is a little cheaper then Suncoast's. I was thinking of doing 2 scoops. One for the intake and one for the turbo. The one for the turbo would be reversed to allow air out kinda like an inverted cowl similar to the Caliber SRT 4 hood but instead of 2 inverted ones this would be a single and will need to consider keeping water from getting on it too.